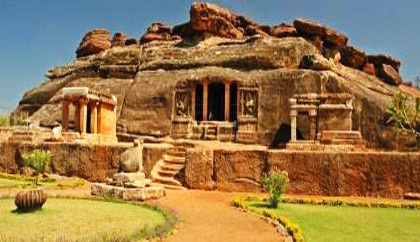 Revalphadi Cave Temple is one of the major attraction in Aihole. The cave temple is dedicated to Lord Shiva, which is renowned for its elegant and intricate carvings and details. Dating back to the 6th Century, Ravalphadi Cave -temple showcases Shiva in diverse forms. Konthi Temple Complex (Kwanthi Gudi), the Uma Maheswari Temple with a ravishing carved sculpture of Brahma nestling on a lotus, the forbidding Jain Meguti Temple and the two storied Buddhist Temple are worth a visit site.